A study reports that more than 20% of adults mountain bike, and that adventure tourism is the fastest growing sector in the tourism industry. Mountain biking is big business. Yes, even in Kansas. 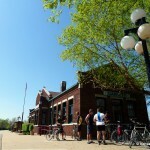 The Travel Industry Association of Kansas has issued a report that challenges the Governor to add biking trails to every scenic and historic byway, and each historic trail through the state, which could have an huge impact on Kansas tourism. Prairie Spirit Rail Trail State Park Open House March 9th in Iola, Prairie Spirit Trail Ultra Marathon March 23rd in Ottawa, Prairie Spirit Trail 17th Birthday Celebration March 27th in Garnett. In response to a number of recent bike/ped tragedies, the small town of Paola, Kansas has pulled together and initiated a project called Paola Pathways, which hopes to build safe paths for active transportation throughout their community. The community of Hutchinson, Kansas is moving forward with plans to improve both their trail system and on-road bicycling infrastructure. The additional trails and bike lanes would be a welcome addition to Hutch's vision of a comprehensive active transportation system. Meadowlark Trail, Southwind Rail Trail, Court Decision On Kansas Reversion Law, National Trails Day Events, Kaw Heritage Park, Recreational Trails Program Grant Applications, Hiking, Backpacking And Horseback-Riding In The Flint Hills, and much more. Congrats to the Kanza Rail-Trails Conservancy, which was recently awarded the Kansas Governor’s Tourism Award at the Kansas Tourism Conference!